For Memorial Day, in memory of the three relatives I know who died in war: John Brooks (War of 1812), Wallace Rosa (Civil War POW) and Raymond Hamm (WWII). I will have to confess that it really annoyed me that I couldn’t find anything regarding Raymond Hamm’s military record during WWII. But when I kept hitting brick walls, I had to shelve that particular research for later. Which means that I moved on to my next question, “Where was Raymond buried?” I didn’t think it likely that his body had been shipped home, so, wouldn’t that mean he was still in North Africa? If so, where were the men who died in the Tunisia campaign buried? The answer is the American Cemetery and Memorial in Carthage, Tunis, Tunisia, North Africa. I went back to the cemetery’s official website and found him using ‘Humm’, along with the bonus, previously elusive, reference of his service number and unit. So cool! Now I had two questions answered. Also included in his entry are any medals he received, in his case he had received a purple heart, something that I didn’t know before either, although that should have been a given. The cemetery is set on 27 acres in Tunisia. There are just over 2800 burials of the military dead from the United States. There is also a chapel and a memorial court where one can find mosaic maps showing images of the military activities that occurred during the US military’s movements across the continent. So armed with this information I now have a clearer picture of Raymond’s movements and activities from when he left Fort Bragg, North Carolina in November of 1942 until his death in April of 1943 around El Guettar Pass in Tunisia. Here is a great map showing the movements of the 60th across Africa during Operation Torch. I have marked where Raymond landed in November and were he died the next April. When Operation Torch went into action Raymond and his fellow soldiers in the 60th landed on the beaches of Port Lyautey, Morocco. Their job was to seize the ‘Citadel’ known as the ‘Kasba’, and they did. In March of 1943 Major General Patton assumed command of II Corps. He was making plans to secure Maknassy Pass and get to the Tunisian plains through the El Guettar pass. The hope was that Rommel would retreat or be cut off. The 60th which was now motorized and attached to the 1st Armored Division, advanced through the 21st German panzer division and took the hill called Djebel Goussa. Several days later they captured the town. But they still hadn’t gotten through the pass. At El Guettar, the 9th Infantry Division was now under the command of Major General Eddy, who had been involved in a car accident and was now leading the troops on crutches. To complicate matters, the enemy possessed air superiority and were very well entrenched in the surrounding hills and gorges that provided a natural defense. The 9th and 1st Divisions’ objective was to seize opposite sides of the El Guettar Pass, thus enabling the 1st Armored Division to roll through without being fired on. At 6 A.M. on March 28th 1943, the 47th Infantry Regiment was in position to take Hill 369. Although the objective area was reached quickly, darkness and poor maps had led them astray to El Hamra Ridge. There was no need to worry the commanders thought: 2nd Battalion of the same Regiment had been sent on a flanking movement and would get the job done. However, 2nd Battalion was caught in a murderous crossfire and 1st Battalion of the 39th Infanry Regiment became lost in the maze of hills. So Hill 369 was still in German hands and the attack bogged down. American troops had previously been occupying Hill 772, but moved off when the offensive began, so the German’s decided to take it back. General Eddy soon realized that Hill 369 could only be taken by getting Hill 772 back. For five days the battle raged in an attempt to break through the El Guettar Pass. Each attack was a coordinated push of an Armored Task Force and the 3rd Battalion of the 39th Infantry Regiment. When it seemed that the Germans were going to mount a major mechanized counterattack on April 4th, the 15th Engineers were sent to occupy defensive positions as Infantry. However, two days later [April 6] it became apparent that the enemy was going to withdraw to head north for a last stand in Tunisia. The 9th Infantry Division attacked to seize Hills 772 and 369. “Benson’s Force” moved through the Pass and met the Eighth Army coming up from the South. Finally, the El Guettar Pass was taken! It was in the final day of this battle, April 6th, that Raymond was injured, badly enough that he died the next day. Unfortunately, I don’t think he was able to partake of his steak dinner. But he could be proud that he was part of a major victory for the Allies in the North Africa campaign. If interested here are two documents that I found online related to the 60th: one is a gathering of maps and the other is a, now unclassified, regimental history of the 60th covering 1940-1942 (I will need to find the rest of this history that covers 1943 to see if there is reference to Raymond, it might include his company assignment too). Im off to Miami. I expect to get there the 18th or 19th of Sept. Should get my commission by Jan 1. Ill probably go for flight training after I finish there. Hope that your cabin is taking shape. Ill bet that you are having a swell time. Catch a lot of fish. I don’t have much time so Ill have to close. I’ve just been rated a corporal so thats some extra pay. I wrote you several letters but they came back because I don’t get free mailing privileges in Canada. Sure have been busy lately. We have been on K.P. and P.P. (common labor) for four days out of the last seven, and now they are making up for the lost time by cramming in our lectures and drilling. Dont feel bad if I write infrequent because we are busy. I don’t know where you can write me after the 26th of the month, but I’ll let you know, as soon as I can. Mom, I appreciate the paper, but maybe you had better discontinue it. The mail facilities are overused here and I don’t like to see some boys not get letters because of the time that has to be spent on papers. We have just about completed our Basic Training, and by the time that you receive this letter, we will have. We only have four weeks, where other branches of the service take twelve weeks. and many other things, that one cant mention. So far I think that I am doing alright. If I can handle men I will make out, and I’m not discouraged about that, because after you learn to take orders you can give them. Sgt. Raymond Fred Hamm was the eldest child of Emma Paugel and Fred Hamm. 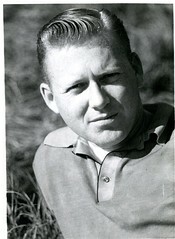 He was born on June 9, 1919 in Minnesota. According to his obituary he was baptized in Phelps, Vilas County, Wisconsin and confirmed in Wittenberg, Shawano County, Wisconsin on September 30, 1934. 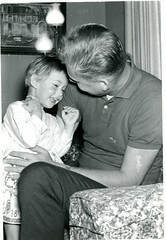 His early years were spent growing up and attending school in the Wittenberg area. He moved to Vergas, which is in Otter Tail County, Minnesota where in 1940 he is living in the same county with his father and brother Arthur all working as farm laborers. 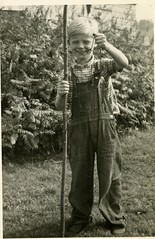 Sometime around late 1940 all the boys had moved to the area of Green Bay / Door County. Soon afterwards both Raymond and Arthur joined the Army, although Raymond waited until September of 1942. After Raymond’s enlistment he was immediately sent to North Carolina for seven weeks of boot camp training, of which two weeks were dedicated to intense rifle practice. After he arrived at the barracks he would have been fed then hustled off to ‘sick bay’ where all the men were inspected and injected, then ejected out the door to pick-up their paperwork, dog tags, IDs etc. They also had the pleasure of a free haircut, clothes, rifles and other necessary gear. When Raymond’s boot camp training was over he was sent to Virginia. This happened, probably, sometime in late October. The transfer to Virginia was most likely because he and his fellow soldiers were getting ready to head to North Africa in November of 1942. Operation Torch was preparing for action. The trip by sea took a little over 2 weeks. As I can find no information on Raymond’s assignment in the Army he could have been on any one of the three task forces seen on the map below, as American forces were on all three, according to the Wikipedia summary. If you have ever seen the movie Patton, the Tunisia Campaign is one of the major battles that they include in the story. Raymond was seriously wounded April 6, and the next day, Wednesday, April 7, 1943 he died at the age of 24. He never married or had any children who can tell his story, as short as it is. Because of the vast amounts of information on stories like this one, regarding Raymond’s North African service, I find it very difficult to condense them into a readable post, so be sure to check out the sources I have noted if you are curious about both the Tunisia Campaign and Operation Torch. UPDATE: I have added a picture to Raymond’s brother Arthur’s post. I forgot I had it, so be sure to check it out. Just received your package & thanks a million. In answer to your letter. I wont be flying, or studying either for a while. I wont be flying at all. as it looks now. Ill probably be a ground officer. Lois will be coming down here to live in 2 or 3 mo. She is working at Rikes in Dayton. We are going to stick all our money in a sock so she can come down as soon as she can. after she gets here the $62 goverment and the Bell Co. checks will keep her till Im commissioned & then Ill get around $250 a mo. Im going to try to stay here on training personnel. School in either Miama, St. Petersburg or Fort Benning. You have to do them all to. I am finding that newspaper research is becoming my favorite part of genealogy because I have been able to find so many family stories that have become lost, deliberately or just due to the passing of time. So here I introduce Arthur Albert Hamm. Born in 1922, he was the middle child of my great grandfather Fred Hamm and Emma Paugel. All three of their children were illegitimate, or to be less crass ‘born out of wedlock.’ Fred and Emma did eventually married in 1931, but I am not sure what the hold up was as both were divorced from their previous spouses by 1921. As per his modus operandi, it is doubtful that Fred was living with the family in 1935. That is the year their youngest son Clarence was killed in an automobile accident. According to the 1940 census, Fred was noted as living in Minnesota in 1935, so my gut is saying that he had probably left shortly after their marriage. Again. All previous research indicates that Grandpa Fred was a love-em and leave-em type of guy, so I don’t know why he would treat this wife any differently. Fred’s sons, Arthur and Raymond, both joined the Army in 1942. Arthur joined up in January of that year. When Raymond (Alfred) was killed in Africa in 1943 Art was sent home on furlough to be with his Mother and half-sister for the funeral. Sometime between 1941 and 1944 he had married, and had two children with Bernice Schultz. Ah, but here’s the kicker. Arthur Albert Hamm died February 15, 1989 in Livingston, Park County, Montana. Prostate cancer and emphysema were the cause of death. Arthur A Hamm, 62, of Livingston died Friday Feb 15, 1989 in the afternoon at the Livingston Convalescent Center following an extended illness. Graveside services will be held Wed. at 2pm at Mountain View Cemetery. Lowry Funeral Home is in charge of arrangements. His wife (ex-wife?) Bernice had told the children he was dead. She later married a man who eventually adopted Art’s children. I guess in Grandpa Fred’s favor is the fact that a no time did he pretend to die or go missing. As far as we know he pretty much just packed up and left, with no subterfuge. His son Arthur was apparently a bit more of a diva. 3 pr. new work sox, also my sweat sox. Well thanks for the bother, I suppose I’ll get the swimming suit today, but the mail is a little bit erratic. We have been drilling just about all the time and its getting hotter here. I think Ill go swimming tomorrow and cool off. Tell Charlie & Lydia I have 3 pals from Marion Theodore Ochs, Underwood and Burr. they are O.K. I also know quite a few fellows from Dayton. Tell me about home when you write again & say hello to Dad and if he dont read this.